In case you are just beginning to read this blog....or just haven't picked up the clues....this Imp adores children! I absolutely dote on my two nephews and any child of which I give care. One of the most beautiful sights in this life to me is that of a sleeping child. To have a child snuggled close to your chest, their soft baby scent surrounding you as they emanate warmth just makes your heart constrict. Parents and anyone who has experienced such I am sure will agree....it is such an overwhelming emotion that it is almost indescribable. I do not have children of my own yet and pray that someday I will be blessed with such, but even as a nanny and now an aunt, I have been able to experience such feelings to the extent that it makes me marvel. It is in that precise moment when selfishness is completely nonexistent, all you feel is a myriad of emotions for that small figure in your arms. All you think about in that time-still moment is how much you love that small one, how much you want to share with him, to teach him, to show him, to see how he marvels at all the things that have become common to you but will be new to him, how you would die to protect him. It makes me flabbergasted that I have such emotions with my nephew I cannot fathom how it will be with a child of my own....but yet it makes me realize something amazing....that is how God sees us. In that brief moment of selflessness when you experience such love for someone it is a brief glimpse on how God loves us. He wants to show us things, to watch us marvel at the glorious perfection of His plan, to see Him through eyes that are new everyday, He loves us selflessly and even died to protect us! How amazing is that! Jesus' is God's son, but yet we are the adopted children of God and He loves us just as much, I tend to correlate this with the fact I can experience the emotions I do for my nephew, though he did not come from me, he is still in a sense my "adopted" child. I praise the fact that though I have done nothing to deserve such, like a still sleeping child, God has such love for me. I pray that all that read this may someday experience such emotions with a little one so that all can understand what I mean. John 3:16 For God so loved the world that He gave His only begotten Son that whosoever believes in Him should not perish but have eternal life. Romans 8:16 The Spirit itself bears witness with our spirit, that we are the children of God. Galations 3:26 For you are all the children of God by faith in Christ Jesus. 1John 4:16 And we have known and believed the love that God has for us. God is love and he that lives in loves lives in God and God in him. Great post. I can so relate...I have done much babysitting since the age of 12, and primarily had the experience you are describing with a sweet family of 4 children I consistently babysat through college, starting out with 2 children and growing with them to 4. There were 3 girls and 1 boy, Sawyer, and I have to say I had that experience the most with him for some reason, probably because he was their 3rd and the other 2 were older when I begain to babysit for them and when they had their 4th baby I was phasing out of babysitting. But with Sawyer I think I had the first glimpse of what it must feel like to be a mother.....awesome feeling and hope to experience it for myself one day, too. I used to sing him "Away in a Manger" while I was holding him to my chest. Those were sweet times and I had their wonderful Christian mother to model, Tracey, and she is still my mentor today. I also experienced this through my nieces and nephews, primarily Nicholas, Amanda, and Hannah. It is cool to correlate this to God's love and care for us, we are His children! I feel so complete because of it. 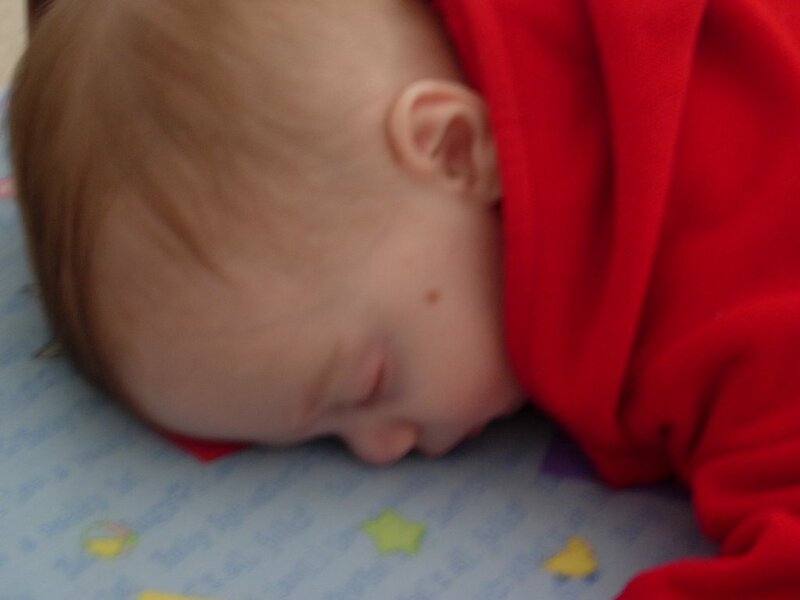 Here, here - there is nothing more beautiful, more powerful, more peaceful than watching a sleeping child. And nothing beats snuggling closely with my son.